* Supplied in Preclipped 1m x 1.2m Panels for Quick & Easy Installation. 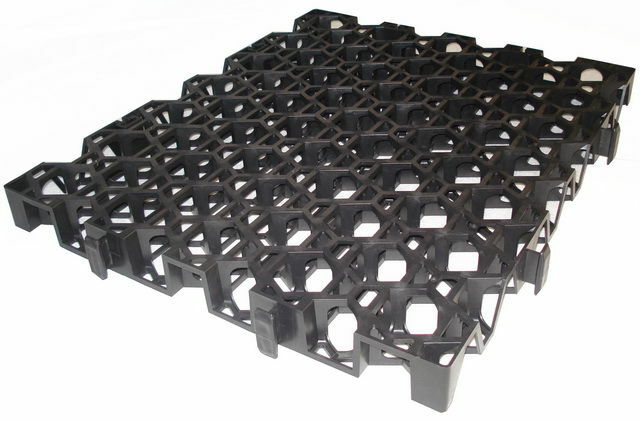 Rainsmart® Nero Pave® is a lightweight, high strength interlocking plastic cell structure designed for the creation of Permeable Grassed/Gravel areas subject to pedestrian and vehicular traffic. Nero Pave® Cell can be used in any situation where low to medium use parking surfaces, access roads and driveways are required. The sub-base requirement for Nero Pave® permeable paving is normally less than the sub-base required for concrete or bitumen paving systems, the large panel size supplied in pre-clipped formats makes installation quick and easy with unskilled labour. Biological & Chemical Resistance Unaffected by moulds and algae, soil-borne chemicals, bacteria and bitumen, Oils & light Acid, Alkaline Solutions.